1960's Cobalt blue nylon organza fitted vintage cocktail dress. 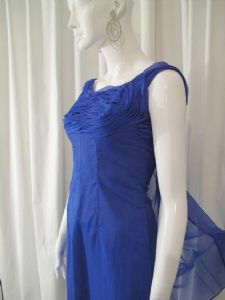 Gorgeous cobalt blue dress with draped organza bust and sleeve details. The neckline is scooped at the front and lower at the back. The dress is fitted with a back zip fastening. There is a flowing organza train detail at the back. Perfect with an 'up-do' and loads of vintage rhinestones.